← The foods of March – what to buy this month…. I’ll be at Penshurst this Saturday buying all kinds of goodies for Easter weekend treats, several of which have just achieved glory at the Taste of Kent Awards last month. 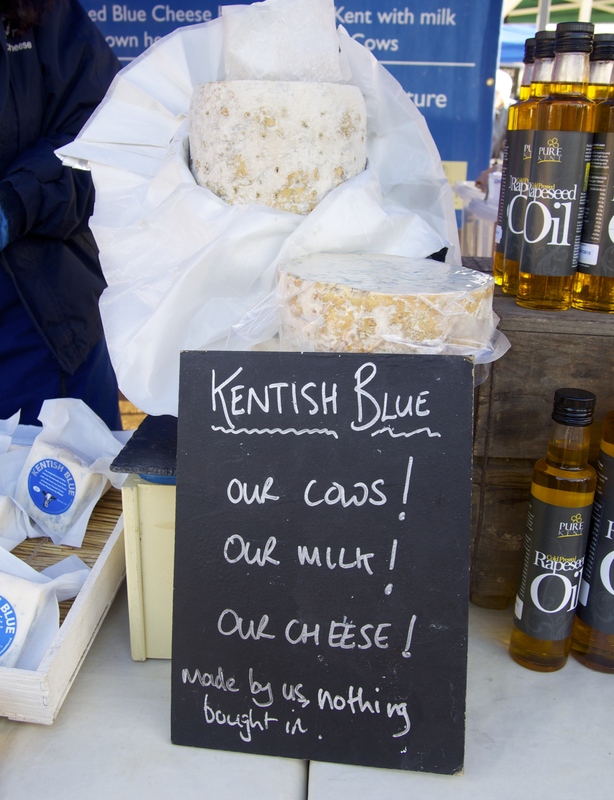 I particularly recommend the wonderful Kentish Blue cheese, a personal favourite for both cooking and on a cheese board, which I will serve with a loaf of Hemmings Bakehouse‘s sourdough bread, on sale at the PureKent stall (and made with their flour, which itself won praise in last year’s awards, and is well worth buying a bag too for baking and breadmaking!). Then on top of my regular purchases of sausages (from their Gloucester Old Spot pigs) from Spot on Produce, eggs from Jenny at Far Acre, and of course, the finest fish from Paul of Arcade Fisheries, it’s proper hot cross buns from Rusbridge’s which beat the supermarket ones into a cocked hat, scotch eggs from Naked and Ready and cheese straws from Dine Thyme, and one of my favourite market treats, spring flowers from Flowers in the Forest. Then I’ll take everything back to the car and start again! See you there….. (and look out as next month I’ll be cooking recipes from, and signing copies of, my new books, The WI Cookbook and Back in Time for Dinner at the May Penshurst market). April has blown in this week so why not celebrate the Easter break at the beginning of the month with all kinds of good things in season now – oysters, venison, crab and early salads such as rocket and watercress are at their peak and other goodies are all starting to appear. Longer days with more light are stimulating growth, the lambs are gamboling in the fields and wild garlic is sprouting near streams and rivers. April still comes with a rather restricted choice of fresh seasonal produce to choose from, which makes it the perfect month to try some of the wonderful array of prepared and preserved products from talented producers across Kent and the south east. In recognition of all these hard working people, it’s once again time for the county’s own food awards, The Taste of Kent Awards, awarded last month. The number of awards has grown with every year as more local food enthusiasts cast their votes in over 13 categories, with everything from butchers, fishmongers, restaurants, pubs and of course, farmers’ markets gaining recognition. These Awards recognize and reward the committed and hard-working producers, chefs, retailers and growers who do so much to promote this county and the quality of its ingredients. The 2015 entries were judged earlier this year, and prizes awarded at a special dinner on 12th March held at the Detling show ground. You will find many of the award winning products at your local markets, with everything from fine cheeses, pies and pastries, local beers and wines, handmade chocolates, artisan bread and wonderful preserves all recognized. Visit http://www.tasteofkentawards.co.uk for more details of award winners before your trip to your local market and then you will know what to look out for. All the winners are well worth making a special trip for, and the standard of entries just keeps on getting better every year. Feature Taste of Kent award winners on your Easter menus, and you can have a lot of fun researching and trying the products whilst exploring new parts of the county at the same time. The top three shortlisted in each category are on the web site to give you plenty to choose from, and if you want to make a day of your food foray to farm shops, producer or one of the many fine food markets across the region, you could make a booking for a meal at one of the excellent pubs or restaurants up for awards this year. They all serve the best of local ingredients prepared by talented chefs served up in comfortable surroundings. I;m planning to visit both the really special George Inn at Molash, winner of the best dining pub category, and The Corner House at Minster – best Kent restaurant – when I head down to East Kent for a (much needed!) break in the middle of the month. So what else should you be buying and eating this April? Fish and seafood lovers will find sea bass, cod, halibut, cockles, mussels and scallops all at their finest now. A whole salmon is a good choice for an Easter meal, and wild salmon and sea trout from Scotland are both in season, and well worth the extra expense for a special occasion. Their firmer flesh and finer flavour come from swimming freely and feeding on a diet of crustacea. Bake whole wrapped in foil with butter and herbs and serve simply with a homemade hollandaise sauce. For meat eaters, the earliest spring lamb will be starting to make an appearance as the month advances. If it’s still too early for your local lambs then at Easter serve a wonderful joint of fine rare-breed beef or pork. For poultry look out for guinea fowl, whilst game dealers are selling venison, hare, rabbit and wood pigeon. You might want to try a fine game pie, either hot with plenty of savoury gravy, or in a magnificent raised pie perfect for an Easter picnic. If you don’t want to make your own, there are plenty of beautiful ready-made versions on offer. As the palette turns to lighter foods with the longer days, lettuces, spinach, watercress, cucumber and spring onions are starting to arrive, taking over from the brassicas such as cauliflower, purple sprouting broccoli, cabbages and kale, to satisfy the desire for salads. Foragers are out after wild garlic so buy it if you see it – the white flowers should still be in bud for the best flavour. Wrap the leaves around fish before baking, or shred the leaves and use in soups, pasta dishes and risottos. Or for the pesto used in our recipe below. 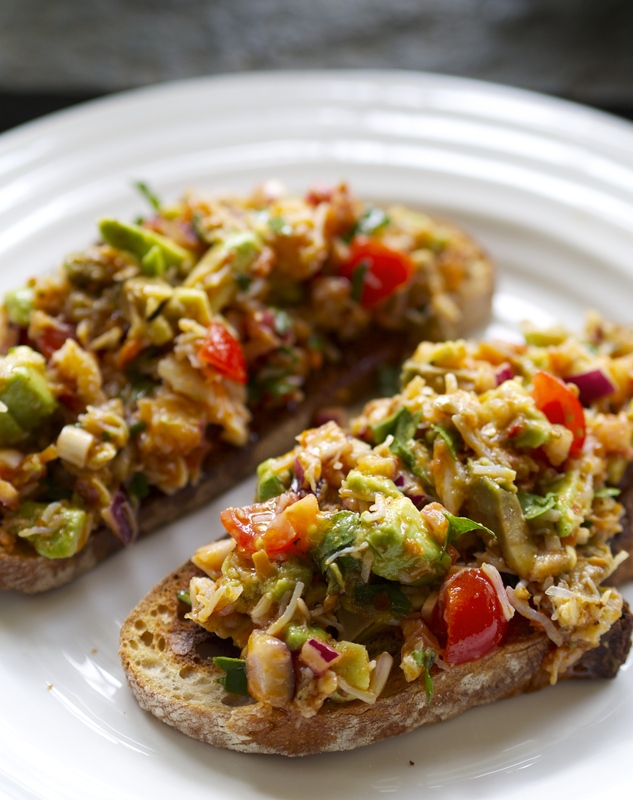 1 Mix the crabmeat with the onion, avocado, tomatoes and parsley. Stir in the lemon juice and pesto to taste. Season carefully – this will depend on how seasoned the pesto is! 2 Toast the bread and drizzle with the olive oil. Pile the crab mixture on top and serve. This entry was posted in Farmers Market, In season, Kent, Local food and tagged Arcade Fisheries, crab recipes, in season, Kent farmers markets, Kentish Blue, Penshurst farmers market, penshurst place, Spot on Produce, TAste of Kent awards, The Corner House Minster, The George Inn Molash. Bookmark the permalink.